As you all know, the trip to Dublin was a smashing success. What stunned me, though, was the amazing numbers of Citizen Cyclists on the streets. When I travel to other cities I'm ready with the camera from the word go, prepared to capture any Cycle Chic shot, however rare. In Dublin, I could relax. There was loads of material. Above are two fine examples. Ellen brought her dad, Conor, to the Cycle Chic fashion show at city hall. We chatted outside afterwards and they obliged me with a photograph. 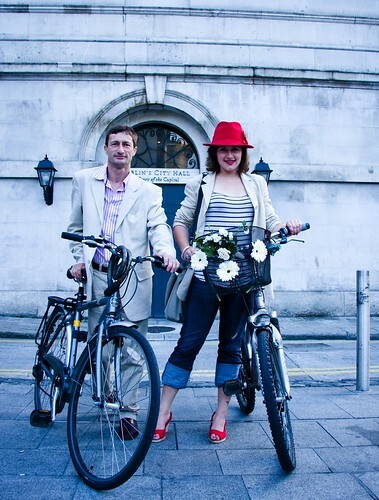 Brilliant examples of Dublin Cycle Chic! Great to meet you, Ellen and Conor! Dublin is the Great Bike Hope, indeed.